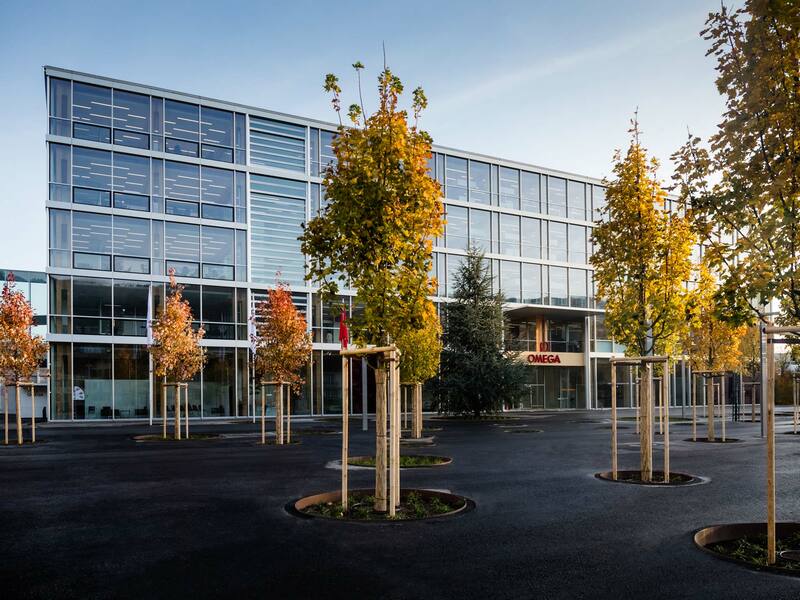 A new factory, including warehouse, was created for the watch brand Omega. The ambitious architectural concept was realized in a timber construction with concrete cores and ceilings. Transsolar developed a climate and energy concept that ensures good thermal and daylight comfort. It is designed for sustainability in terms of energy and room comfort. For example, by using daylight over the large-surface glazed outer facade, the internal heat loads for artificial light are reduced while also saving electricity. Utilizing triple glass was obligatory to keep transmission losses in winter as low as possible and to prevent cold air waste on the facade. To reduce solar gains in the summer, an external sunshade is automatically controlled and adjusts the slat angle for an optimization of unwanted solar gains, sufficient daylight exposure and desirable visual access to the outside. The room conditioning takes place by means of heating-cooling ceilings, which on the one hand enable the high requirements for compliance with strict room temperature limits and on the other hand ensure good thermal comfort with pleasant radiation temperatures. The ventilation system is thus no longer primarily the room conditioning but is regulated according to the CO₂ and dust concentration in the room air, which is absolutely critical in the workshops for the repair of high-quality watches. The soil or groundwater is used as a renewable source of cooling and heat, which in summer is used directly and in winter over a heat pump for ceiling radiant systems. Thus, the temperature level of the available free energy sources and the systems in the building are optimally matched. The power demand can be partially covered by photovoltaic on the southeast facing roof of the new building and additionally on the roof of the parking garage.